We recently spent some time learning about the History of Flight. In particular the first man to fly across the English Channel, Louis Bleriot. This is an interesting story, although it didn't have the kids on the edge of their seats. 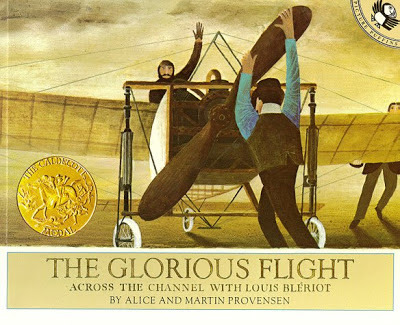 It's slow and methodical but we all learned a great deal about flight, perseverance and Louis Bleriot. 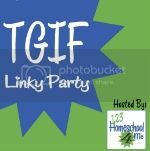 We completed several of the lapbook components found over at Homeschool Share. A huge thank you to all that contribute over there. 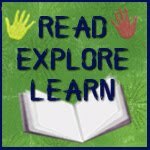 It is a fabulous resource. When Lego Lover saw what the younger crew were up to he was fast to jump in and ask for his own copy of the lapbooking materials. He has always had a keen interest in flight so I wasn't surprised when he asked to do this one. Here's a closer look at some of the mini books. We found and labeled all of the parts on an airplane. We had some fabulous discussions about trying your hardest, 'getting back up on that horse' so to speak and perseverance with the pack of quotes that are included. We found many ways to relate these quotes back to ourselves so now when someone looks like giving up we jump in with a reminder about Louis Bleriot and his perseverance. 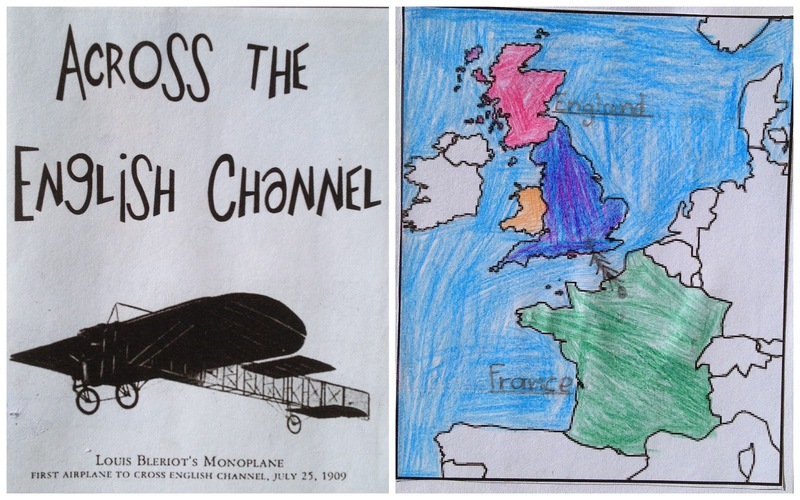 We found France and England on the globe, looking at the English Channel and coloured a small map to go along with that. 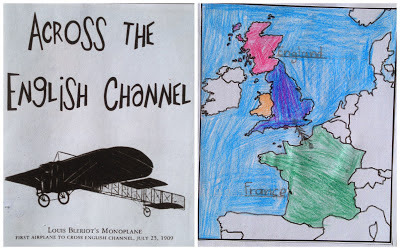 It took Bleriot thirty six minutes to cross the channel back in the early 1900's. 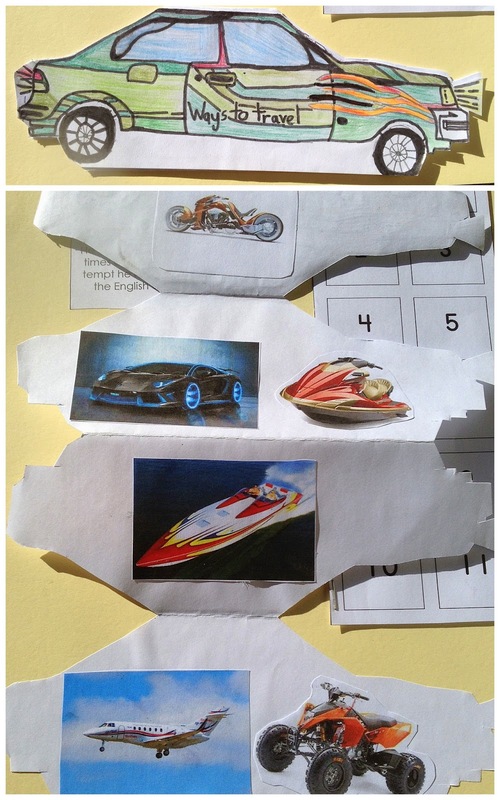 The kids used google image search to find various images of "ways to travel'. You simply cannot read this story without looking more closely at the History of Flight itself, this timeline is included in the lapbook materials. I found this short clip on You Tube - The Animated History of Aviation. It is very well done. Albeit very short and you need to be watching very carefully to see all of the details. This You Tube Clip is done by a boy for a school project, it's not too bad for covering this in just a few short minutes. Our cute little popstick plane magnets were a hit and oh so simple! 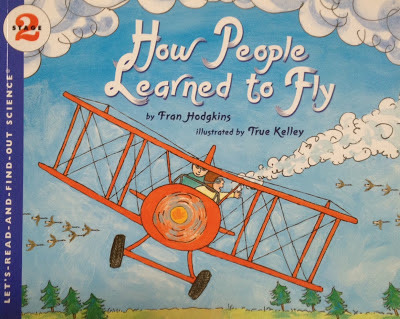 One of the books we used along with The Glorious Flight was How People Learned To Fly put out by Lets Read & Find Out Science. 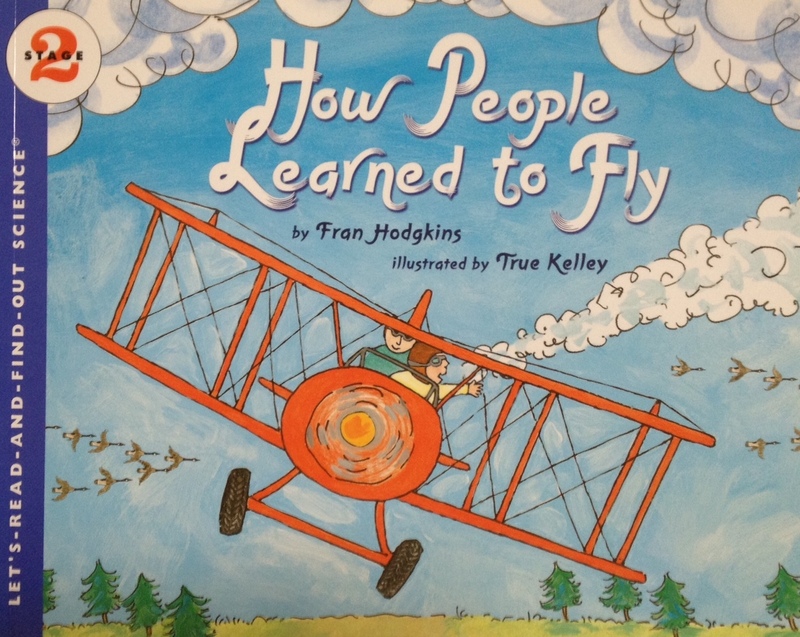 This covers the history of flight from a scientific viewpoint but is aimed at and written for children. As always with this series it was a great addition to the theme. Once again I displayed whatever items we have on hand to go along with the current topic/theme. The kids did a quick run around and found any planes we had, which wasn't many so they decided to put one together with bristle blocks. 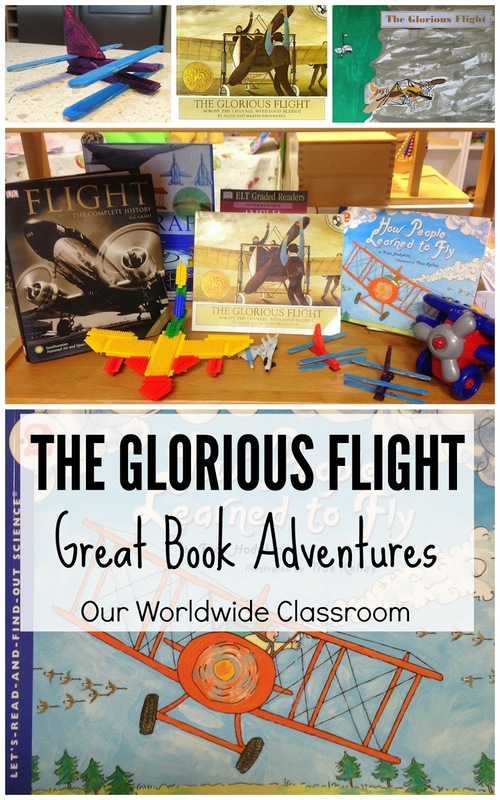 Whilst not one of our most exciting Book Adventures we sure did learn a great deal. Please visit my Pinterest Board for all of the links to the printable materials, crafts and other Glorious Flight activities. Today we were lucky enough to attend a Science Workshop all about Atoms & Molecules and the Periodic Table of Elements.....aahhhhh yes that scary thing, well at least it has always been scary to me, but thanks to this workshop it is no longer so! 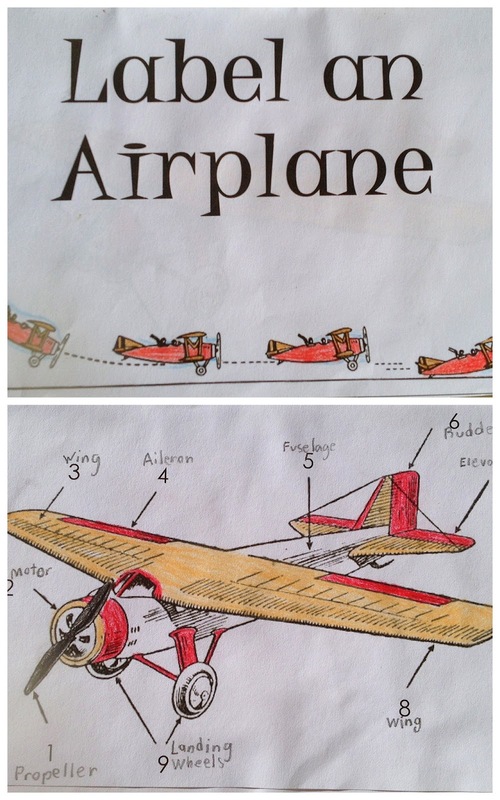 One of the true blessings of home schooling, learning all over again right alongside your kids. 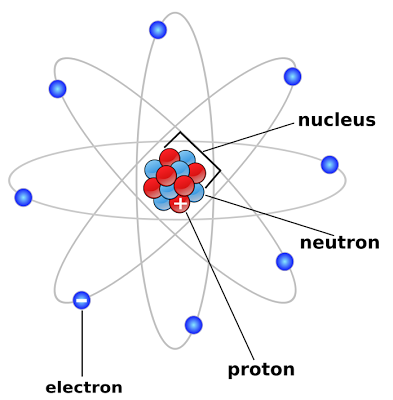 After a discussion about atoms, protrons, neutrons, electrons and the nucleus we learned that Democritius, a Greek philosopher who lived around 400 BC came up with the idea of cutting gold in half until he couldn’t cut it any further, he called that smallest particle the atom. Sir Rutherford found out (around 1910) what the inside of the atom looks like and his experiment was done with gold foil. 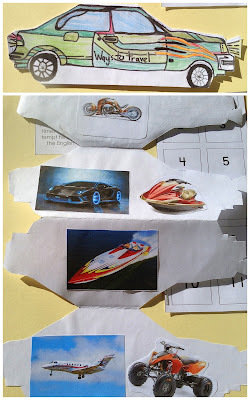 Each child was given a sheet of paper to replicate the gold foil experiment. The paper needed to be cut in half, then in half again and in half again and in half again and so on and so on you continue cutting the piece in half (discarding the other halves) until you can no longer cut any further. The highest number of cuts our group produced was 14. A discussion ensued as to the number of times we would need to cut our paper in half to get it down to a single atom. We had numbers from 1000 up to some ridiculous amounts that I can't even type out lol!! In reality we would need to cut our paper in half 31 times to get it down to a single atom. From there we went on to explore the Periodic Table of Elements. This one little chart often invokes fear in many, but when someone has the ability to explain the chart in an easily understood way all of that fear is released. The children were all given their own copy of the chart which they would use later when building molecular structures. After getting home from the workshop I went looking for other charts and found these very cool, full colour, FREE Printable charts. One with images and one without. Download them over here. 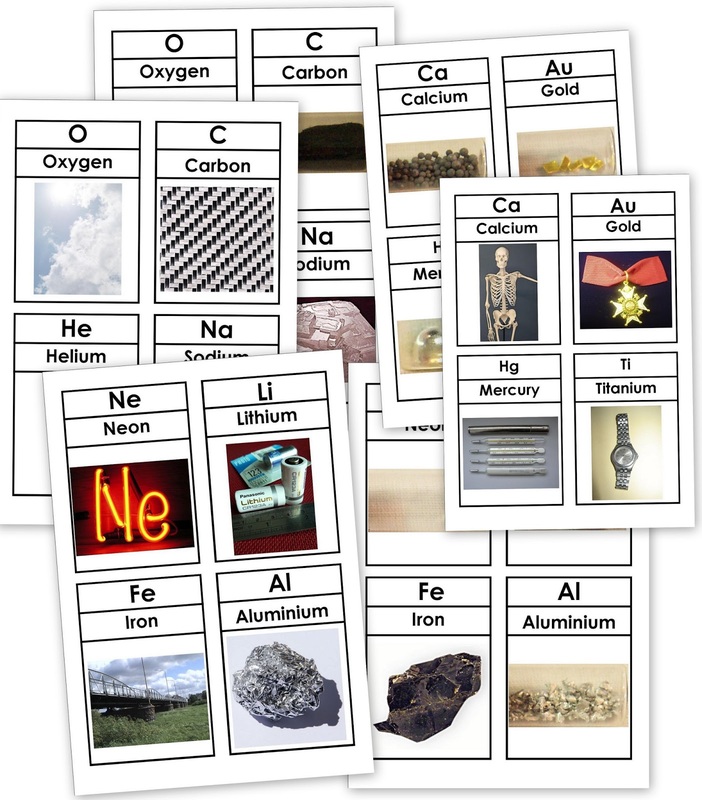 The same site also has this set of FREE printable Elements Cards. 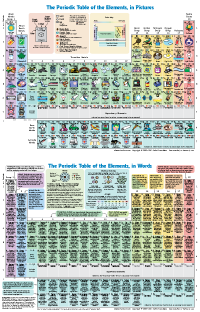 There are other goodies over there too and you can even order full size posters of the Elements Charts. Make sure you go and have a look. In pairs the group did some more exploring of the elements. They were given a set of cards they needed to sort and match up. 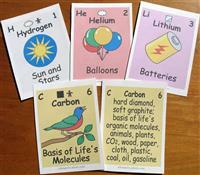 The cards included images, the element symbol and the element names. Some of these were quite tricky but certainly a good way to get loads of practice with them. 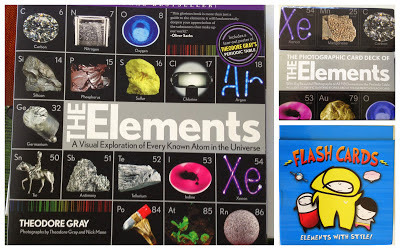 I've put together a set for my kids to use here at home so they can continue to learn the various elements. It is only a start and at some point I will add to this set but you can download a copy for your own use here. 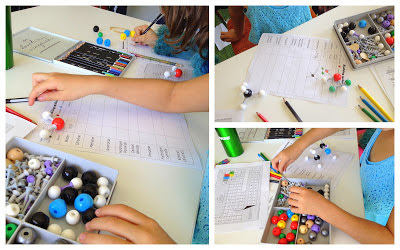 Now that everyone had a pretty good grasp on the concept of atoms and their components and the Table of Elements we moved on to building molecular structures. Starting off with pretty simple structures such as Water and moving along into more complex structures like Ethanol. These kits were certainly a good visual aid for seeing and understanding the structures. I've already begun looking at a kit for home use. For Australian's this is one I am currently looking at which is very reasonably priced. This brought us to the end of the session. Here each table of children were asked to choose an element. They were given various cards with snippets of information about that element. Together in their small group (after a brief time for brainstorming and preparation) they had to present their chosen element to the larger group. A great way to round out the end of a fabulous workshop. Some of the resources that were used during the course of the day and recommended as good to have on hand for home use. I wanted the kids to 'wrap this up' in some way with a brief culminating activity, so I had each of them work on a notebook page for their science notebooks. We also spent a few minutes learning a little more about Sir Rutherford and completed a "Famous Person page" about him. Download a blank copy of this here. Overall this was great introduction to the Periodic Table of Elements, Atoms & Molecules. Be sure to have a look at Science For Home Educators they offer workshops in Australia and New Zealand and a Science at Home Awards Program available no matter where you live. We've been having loads of preschool LEGO fun lately. There is so many fabulous ideas on using LEGO this theme was so simple for me to put together. All I needed to do was visit my Pinterest LEGO board and it was all there waiting for me! He chose to hand draw his bricks as opposed to placing the actual bricks onto the strips. Matching the names to the characters. The only two he didn't know was viking and mime. Ink pad stamping with Duplo blocks. Of course there's always plenty of building going on. Plus others that didn't get photographed. What little boy doesn't like playing with LEGO. Thanks to the wonderful people that put together all of these LEGO bits and pieces. You can access all of them on my LEGO Pinterest board.